← You Can’t Pass This Up!! As I waited upon the Lord this morning I kept seeing a picture of our green fir trees with the glistening ice on them that we photographed yesterday. Then it became a vision in which I saw that beautiful glistening green come off of the trees and begin to swirl around lives. Out of the green came gifts; like the gifts under a Christmas tree. The gifts were boxed in “see through” or clear boxes. One had green vegetables in it and I somehow knew that it represented health and healing for those who opened it. One had small seedling plants and I new that it represented new life and new beginnings for those who opened this box. Another box held green cash which obviously represents financial provision. Then there was a box of green fruits; kiwi, limes, grapes, mangos, etc. and I knew that fruitfulness was coming upon those who opened this box. There was a box that contained green grass and I understood that it represented rest and peace (green pastures). Last, I saw a box with a plush green blanket and green glass Christmas ornaments with the word “JOY” upon them and understood that it was the gift of “comfort and joy”. There were more but that is all that I will mention for now. This green swirl released these gifts like a gentle snow coming down and as they did those whose heads had been downcast with discouragement and weariness suddenly looked up with a look of wonder as these gifts came down. If you have ever been present during the first snow of the season there is a stillness and sense of wonder when those first flakes float down that causes you to look up. As these gifts came down all of the chaos and striving that had accompanied the time of lack was finally stilled and the wonder of grace rested upon these men and women. Comfort and joy came upon each one. 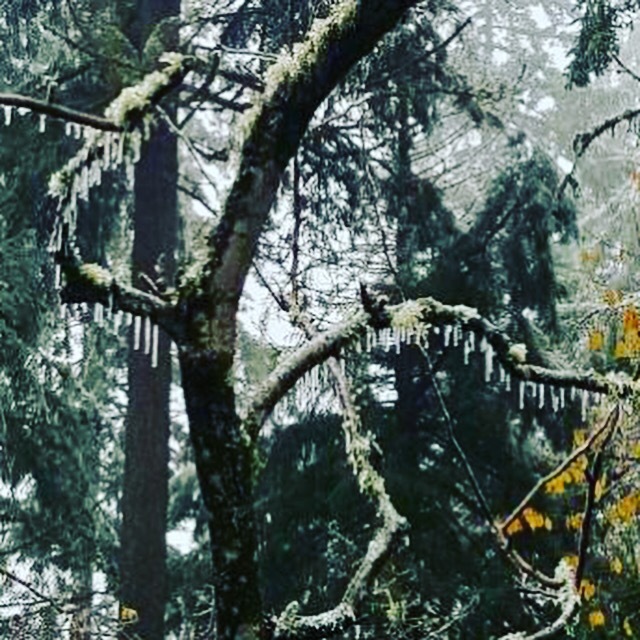 The final vision that I saw was once again from the original picture of the ice crystals that were upon our fir trees yesterday. I saw a wind come that shook the branches and the ice crystals loosened and began to fall. When they landed they were diamonds. I then saw God’s people trying to walk among deep drifts of diamonds (like deep snow drifts). I felt that this represented a number of things; a transfer of wealth, a release of greater revelation and knowledge of God, new facets being added to your life, a season of promises revealed and fulfilled (when light shines on a diamond it will reflect a rainbow), many coming into the family of God and last, a return to first love (like an engagement ring). What a good, good Father we have!